Is The New Sade Album Any Good? During recent promotion Sade stated: “I only make records when I feel I have something to say. I’m not interested in releasing music just for the sake of selling something.” This explains why ‘Soldier Of Love’ is the band’s first album in a decade and why it’s only their sixth studio album during their 27 year career. Their last album ‘Lovers Rock’ is one of our all time favourite albums here at Pop Cart… so will it live up to expectations and ten years of waiting? It kicks off in stunning fashion with, ‘The Moon And The Sky’, which, is a gorgeous lament of lost love and the pain it brings, it is closely followed by the single and album title track ‘Soldier Of Love’, which is hypnotic, richly intense and powerful – the drum beat mimicking the regimented march of an army – it’s magnificent. ‘Morning Bird’ is a touching and simply produced number with it’s lush strings and brooding piano. ‘Long Hard Road’ is a tale of despair but with a positive outlook for the future. ‘Bring Me Home’ is a deceptively upbeat song delivered with passion and sorrow. With the exception of the title track, nothing jumps out at you during the first listen in the way that ‘Somebody Already Broke My Heart’ or ‘King Of Sorrow’ from Lovers Rock did BUT with each listen you are rewarded with more – a lyric, a beat, an instrument that was previously missed. 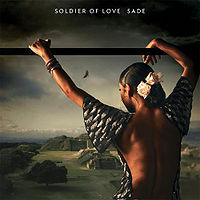 In short, ‘Soldier Of Love’ is smooth, polished and happens to be everything you want and need from a Sade album. ‘Solider Of Love’ is currently streaming in full via we7. You can see an interesting 10 minute making-of-the-album video features below.